Know the Tradition of Bullfighting Matches - Originally the bullfight show originated from Spain, then spread to several nearby countries such as Portugal and France. And Mexico is one of the most conserving countries. In Mexico this performance is usually held in a field called Plaza de Toros which is located right in the heart of Mexico. The capacity of Plaza de Toros is able to accommodate around 40 thousand spectators and is one of the largest bullfighting races in the world. Matador literally means KILLER, and the killer or culprit is referred to as TORERO, and or also called TOREADOR. Not all Torero can be called a Matador. Because the title of Matador is usually only given to those Torero who are experts and have experience defeating many bulls in the field. The show of bullfighting lasts for a long time, which is about 3 hours, by showing 6 bulls ready to die in the hands of the Torero (Matador in English). There are 3 Torero people, each of whom gets a share of 2 bulls who have an average weight of 400 kg to be kakukkan. Every match, each Matador or Torero is accompanied by 2 bull back stabs (Picador, in Spanish) while riding a horse. And there are 3 needles to the back of the bull (Banderillero, in Spanish). This banderillo is in charge of helping the Torero conquer the bull. Generally, the role of Banderillo is also as important as Torero. In matador shows we often see a matador wagging a piece of red cloth. Well, the red cloth is called MULETA. Muleta is a piece of red cloth that is hung or stretched on a wood or stick. The purpose of this muleta was to provoke anger or the attention of the bull to be aggressive to attack the matador. Then why should the color be red? Actually you don't have to be red, other colors like white, blue or yellow can also be used in matador battles. Because the bull basically does not recognize colors accurately (aka color blindness). The rest of the red color in the muleta is more due to tradition, or to be more easily seen by spectators from various corners of the field. Furthermore, there is another term in the matador fight, namely FAENA, faena is an evasive movement or avoids the bull's attack shortly after the matador wags the muleta. Well, in a matador show, this faena action is an exotic style or movement. If you see a matador show on television, you will usually see a small spear that looks like a duster that sticks to the bull's body. Well, that's called BANDERILA. The banderila is a type of harpoon or a decorative or medium-sized small or long spear used by a Banderillo to stab the bull's shoulder. One thing you have to remember, that a true Banderillo will never put a tag in another part of the body besides the bull shoulder, which is commonly called MORILLO. Morillo is the soft part of the bull's shoulder that is targeted by the bullfathers. Bullfighting starts with Paseillo, where all participants who enter the fight enter the arena and introduce themselves to thousands of spectators. Next, the alguacilillos rode a horse to the leader of the organizers, then symbolically asked for the key to recite the bull, "Puerta de los toriles" (the bull was behind the door of the arena). The cage door opened and the bull first entered the arena. This is where the battle of three parts begins, each part is separated by the sound of a trumpet. In each match there are three bullfighter, each assigned to face two bulls, the time spent about 10-15 minutes per bull. The first part, torero uses capote, large purple or yellow cloth. Then, the picadores riding a spear in the hand used to stab the bull muscle to weaken the strength of the bull. The second part is called suerte de banderillas, where three banderilleros are challenged to attach each pair of banderillas, shaped like wood, to the back of a bull. The last part is called suerte suprema, where we often see torero with muleta, red cloth. He must be able to show faena, mastering bull skills. In this section we can see the beauty of bullfighting, a way to bring a bull close to Torero's body and finally kill the bull with his sword. 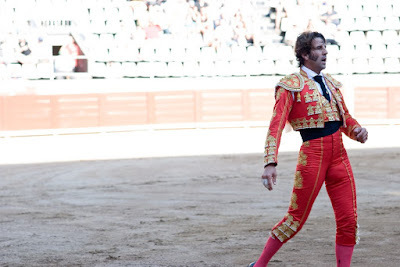 One of the most famous matadors of all time is Juan Belmonte, whose techniques are merevo-fight, and then became the standard in the matador's assessment these days. The most successful matador will be treated like a star, with abundant income, lots of fans, and often rumored by tabloids. However, at this time the profession of matador did not get as much income as his parents in the 1960s. The media also mostly covered only a handful of bullfathers who were known as "mediaticos" which did not include Spain's top fighters. With the dangerous nature of the fight, more than 40 matadors have been killed in the battlefield. One of the most famous fighters in history, Manolete, died in battle in 1947.